To kick off our Christmas celebrations we went to Santa Land at Bass Pro Shop. 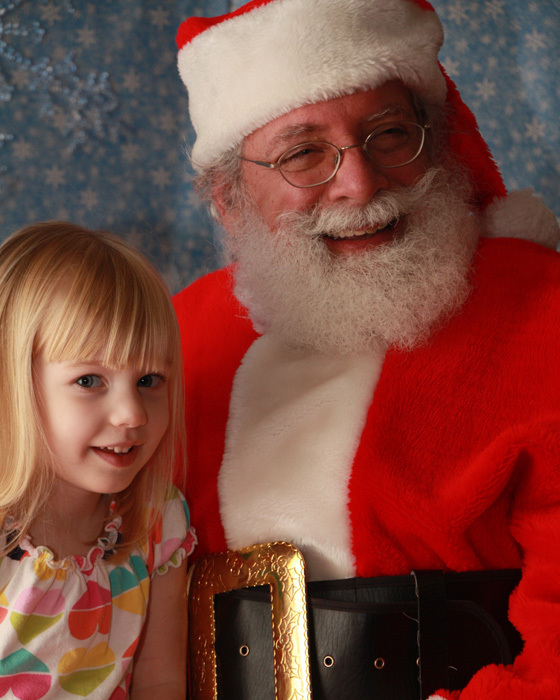 It's a fun and free way to see Santa. Way better than heading to the mall. They have games and crafts for the kids. 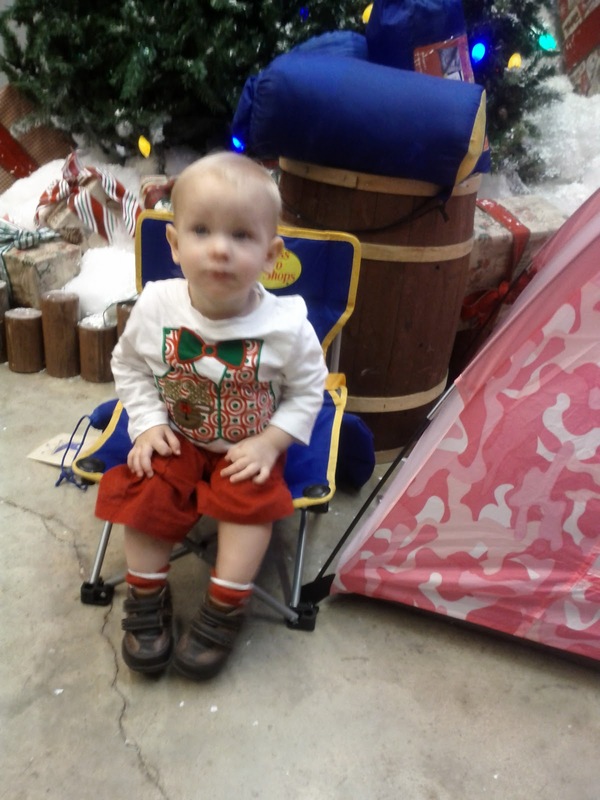 Cody tried out the kiddie camping gear. Nanook of the North tried on the furry hats. Cody wanted nothing to do with Santa. Nothing! He flipped out. 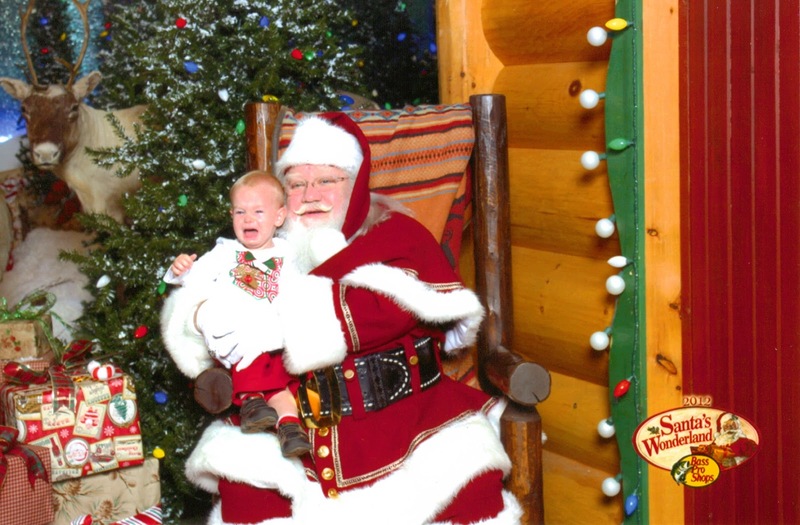 But Santa was nice enough to hold him and smile while asking the elves if they got the picture yet. 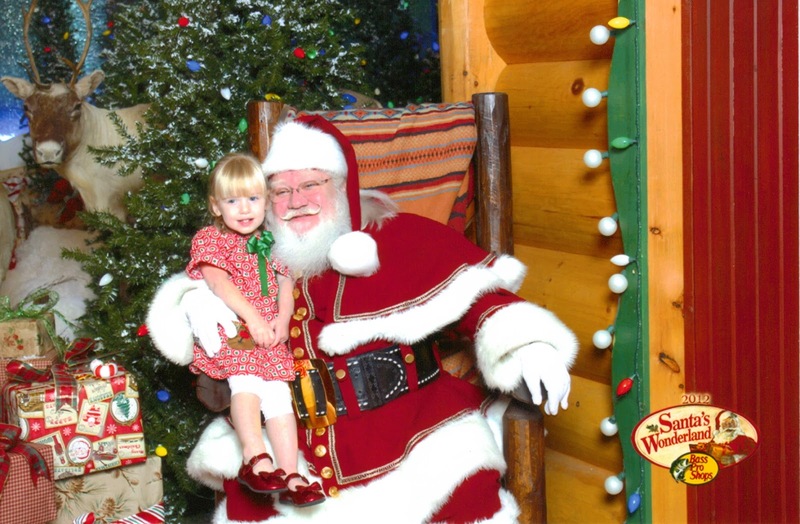 Sarah enjoyed meeting Santa. I couldn't quite hear what they were talking about. 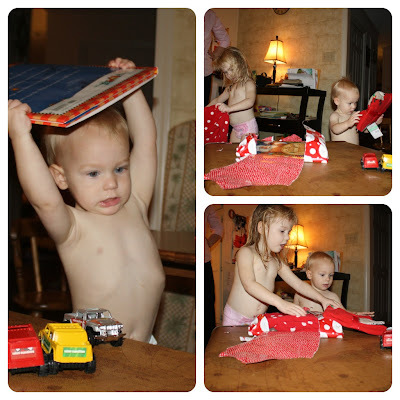 I'm not sure if he asked her what she wanted for Christmas or if she was just talking about all her favorite toys and her favorite color. On the 2nd Day of Christmas the Schwartzs drove around our neighborhood looking for lights. No pictures of that. Sorry. It's us in a car, not very photo worthy. On the 3rd Day of Christmas the Schwartzs went had Breakfast with Santa at the Firestation. 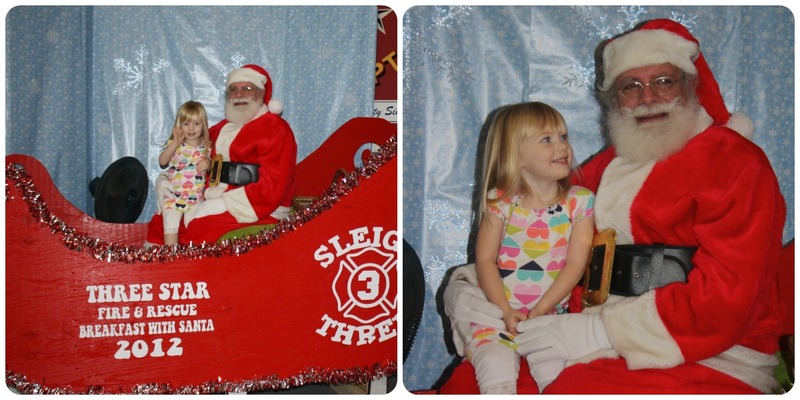 Tina (top left picture with Sarah) told us about the local volunteer firestation's annual breakfast with Santa and we decided to check it out. It was wonderful! They have a big breakfast with all the fixings, a coloring contest for the kiddos, and christmas tree waffle cone decorating. 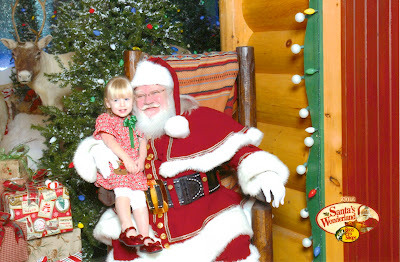 Then it was time to sit with Santa. Again, Cody wanted NOTHING to do with it. Sarah was ready and ran right up there. This Santa was great. He asked her what she wanted and talked to her about her baby brother. Look at that huge smile on her face. She's loving talking to Santa. They even had someone there taking pictures for you and then you gave them your email address and they sent you the pictures they took. 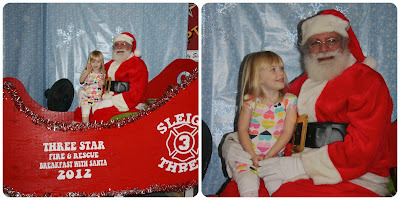 I love this one of Sarah and Santa. 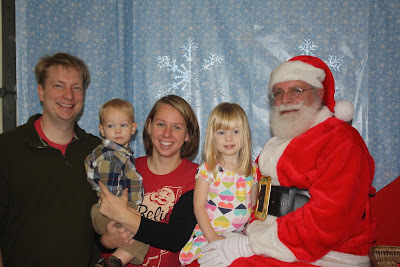 We dared to take a family picture with Santa. It took a few minutes for Cody to stop crying. He was pretty sure we were going to hand him off any minute the man in the suit. Oh well, maybe next year he'll be ready to sit on Santa's lap. 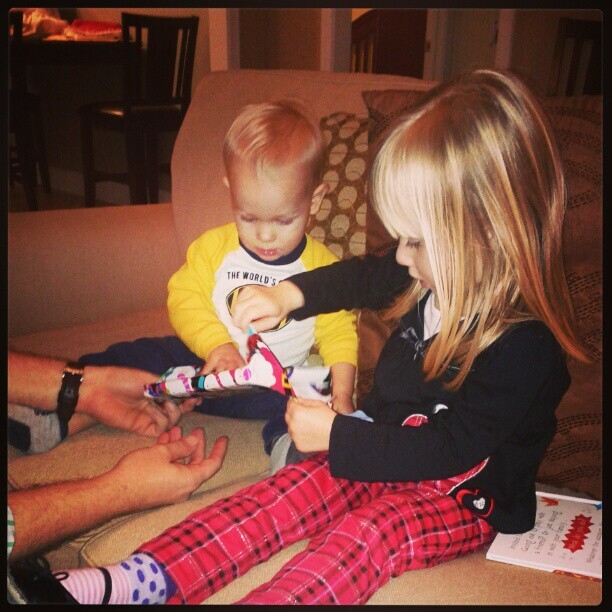 On the 4th Day of Christmas the Schwartzs made Jingle Bell Wreaths. 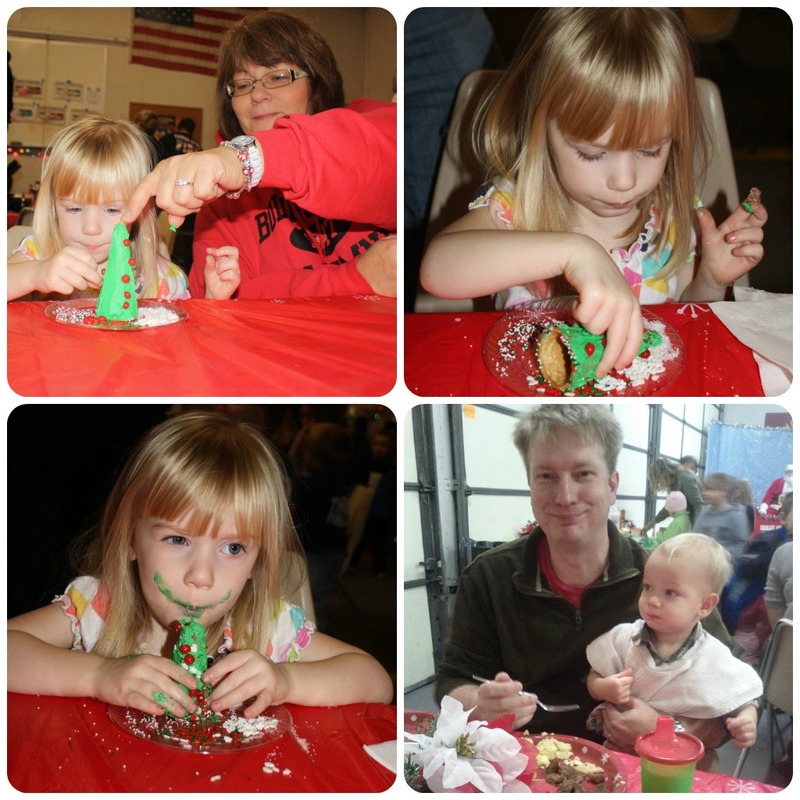 Sunday we made wreaths with pipe cleaners and jingle bells. Sarah put the jingle bells on the pipe cleaner and then I helped her wrap it around a pencil. Cody didn't want to take a picture with his jingle bell wreath but we did snap this cute one of him with his reindeer antlers. He only let them stay on because he didn't know they were there. On the 5th Day of Christmas the Schwartzs strolled Starry Nights. This year I heard that on Mondays Starry Nights is car free. You can walk, bike, roller blade, or even pay for a carriage ride. Lots of people brought their dogs which Cody was so excited about. He loves dogs right now. 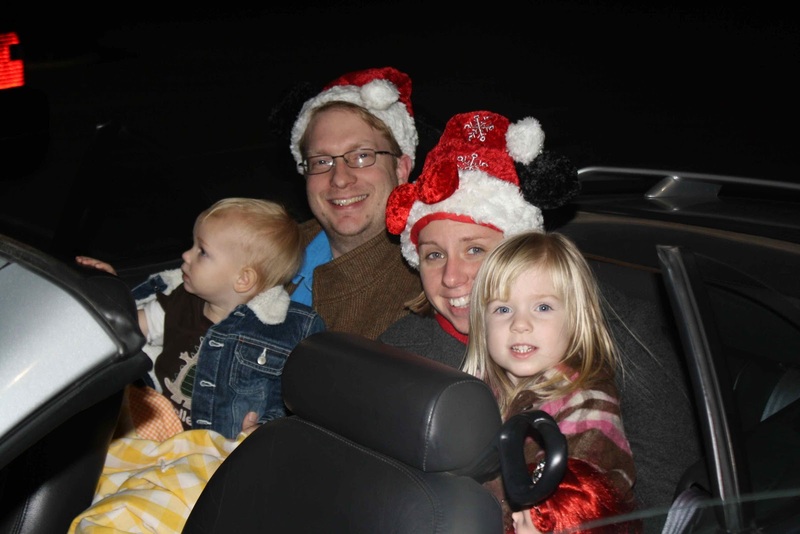 We asked the Williams if they wanted to go with us and we had a great time. It took longer than I anticipated but I also walk really slow and I didn't think about the fact that when you drive through it, you do just that drive THROUGH. If you walk it, you still have to turn around and walk back to your car! So I think we spent about 3 hours there if you count from getting in line to try to get into Shelby Farms to getting out of there after watching a few people get towed out of the mud. I loved walking it! I think that's the best way to enjoy Starry Nights. 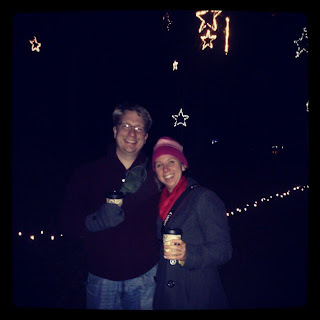 I dare say I like walking Starry Nights more than Zoo lights. It wasn't too cold for us adults because you know, we were walking. But Sarah's legs were pretty cold when I was changing her into her pjs. Still she said she had a good time. I think the cutest thing was when we were walking back to the car Sarah said, "Daddy I want to hold your hand". So Chris walked beside Sarah while she rode in the stroller holding his hand. Then Cody looks around and holds his hand out for Dustin. So there's the two big men walking along the side the stroller holding my little kids hands. So sweet. 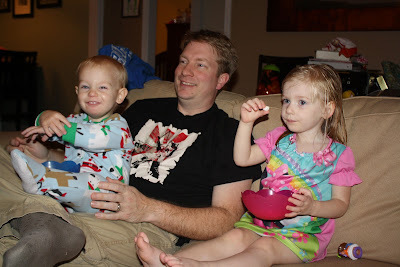 On the 6th Day of Christmas the Schwartzs watched Frosty the Snowman ate Snowman Poop. 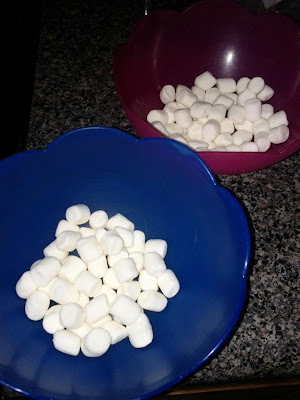 I told Sarah in the bath that tonight we were going to watch Frosty the Snowman (she loves the song but hadn't seen the cartoon) and eat snowman poop. She said, "What?!? Eat Snowman poop! That's yucky! You can't eat snowman poop. 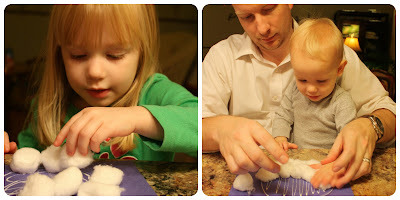 Snowman poop is stinky like mine." Funny girl. When I brought out the bowl she was content to eat it. And smart enough not to say it wasn't snowman poop. This is my new favorite picture of Cody. Look at that face! He was pretty excited about his bowl of snowman poop. And I think he even sat with Chris and watched most of the cartoon. 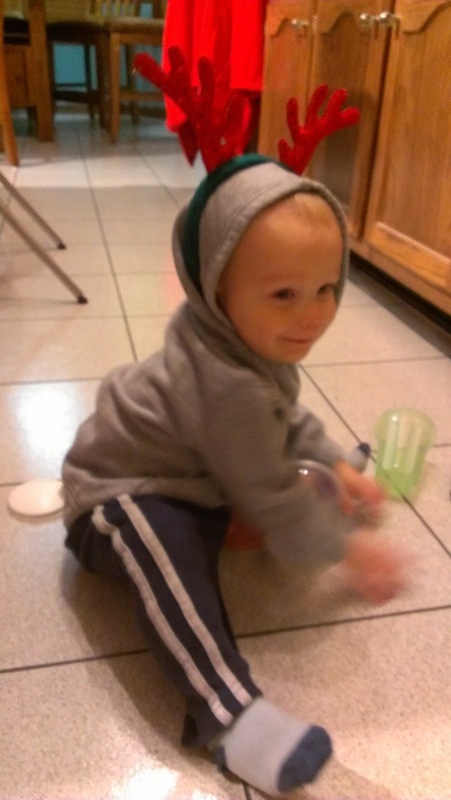 He got up to dance at one point and then wandered into the kitchen with me. Such a silly boy. Sarah stayed glued to the tv. When it was over she was upset it was time to go to bed. She told me, "Mom, I NEED to watch more frosty." She's a tv addict. On the 7th Day of Christmas the Schwartzs rolled and cut out sugar cookies. 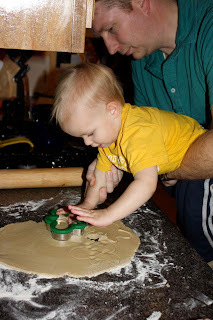 I'm not a big "from scratch" baker. I make cakes using boxes. I have no shame in that. Someone else already measured out the flour, sugar, and whatever else and put it in a box and that works for me. I still consider it homemade because I have to add eggs and stuff and beat it up and bake it. So there ya go. But once a year I get out the beautiful red kitchenaid I got as my college graduation/wedding present and make some honest to goodness from scratch sugar cookies and cream cheese frosting. And I must brag, my sugar cookies are delicious! Cody and Daddy cutting some ginger bread man cookies. 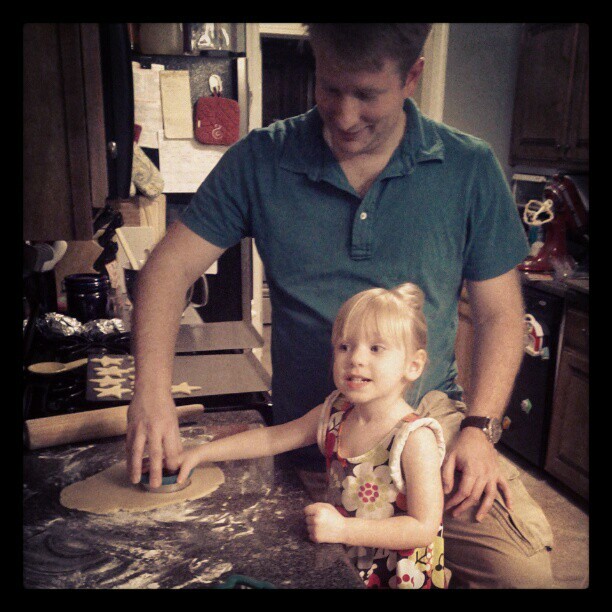 Sarah and Daddy cutting some cookies. 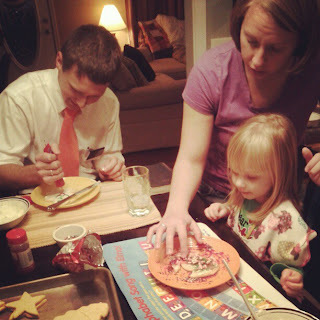 On the 8th Day of Christmas the Schwartzs had the missionaries over to decorate sugar cookies. Cody was not as excited to decorate cookies as Sarah was. We put some frosting on one for him and gave him a pinch of sprinkles to add to it. He just ate the cookie and then whined to get down. Sarah on the other hand had a great time. After she dumped almost the entire bottle of red sprinkles out on one cookie though I learned to hold the bottle for her and let her shake my hand. That seemed to work better. She had a great time decorating cookies and we even let her eat a few. On the 9th Day of Christmas the Schwartzs opened a new Christmas movie to watch in the drive over to Grandma and Grandpa Smith's house. I know this one is a stretch but we had a long drive ahead of us but I didn't want to not do something for our day of Christmas. So I bought Sarah and Cody the Santa Paws movie since they've been advertising it on Disney Junior so Sarah wanted it and Cody loves dogs right now. 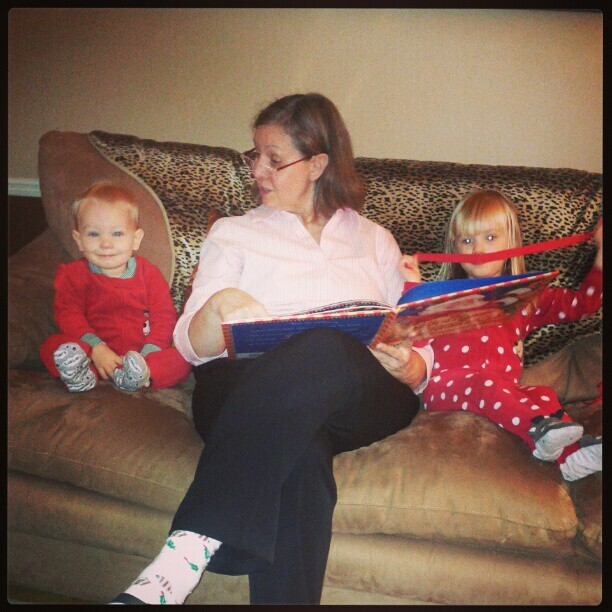 They got to watch it on the drive over to Grandma and Grandpa's. I have no idea what it's about, but she said she liked it and asked to watch it on the drive home too. 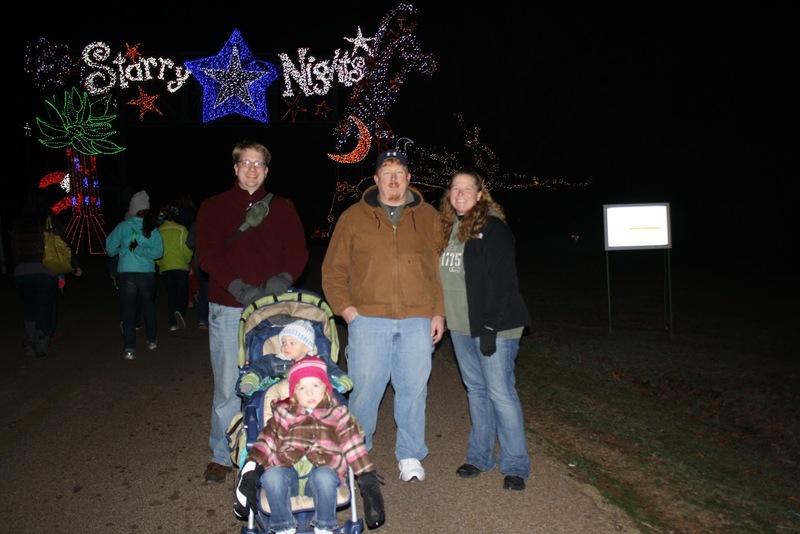 On the 10th Day of Christmas the Schwartzs went to the Enchanted Lights Display in Pine Bluff. This was a cool light display! They had over 165 (I think, I can't find the brochure they handed out) and I'd say 90% of them were some sort of moving display. You know where the soldier saluted or shot a cannon ball over the street. They had quite a few arches and tunnels to drive through. It was a really nice and long display. We consolidated down to mom's convertible and put the top and windows down so everyone could look around and really see everything. 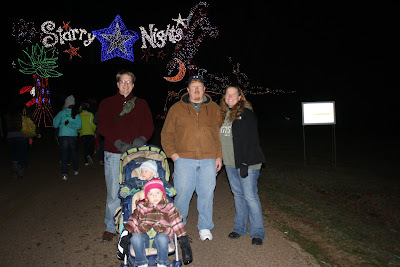 We bundled up in blankets and blasted the heat so it was a nice drive through the display. On the 11th Day of Christmas the Schwartzs made snowmen. 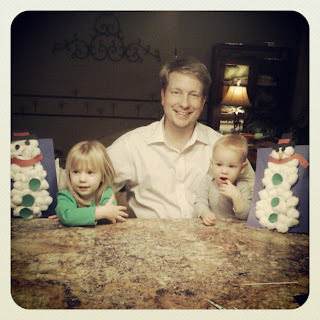 Sunday we crafted quite a bit with the kids. They made snowmen out of cotton balls and then decorated them with construction paper. 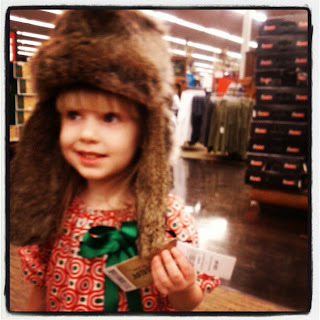 Sarah was so cute, she kept saying, "I need some paste on this". 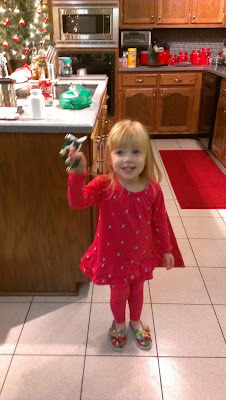 After a while we realized she learned that from Doc McStuffins since we all say glue. They also decorated some construction paper Christmas trees with buttons from Grandma's stash. Sarah loved it! Cody could have cared less. But I think Chris enjoyed it the most. After we were all done he said with a huge smile on his face, "that was a lot of fun dear! Thanks!" On the 12th Day of Christmas the Schwartzs opened our Christmas jammies and read the Twas the Night Before Christmas. 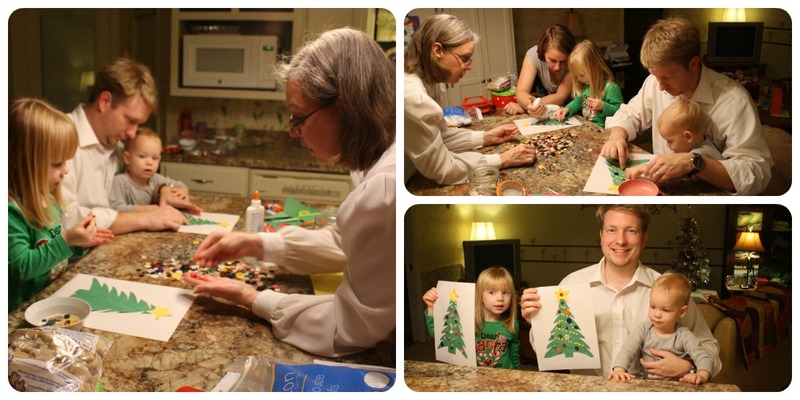 We had a great time doing some little things every day leading up to Christmas. It wore me out and I was ready for it to be over, but everyone enjoyed it enough that I'd do it again next year.